The perfect machine for finishing your papercrafting, cardmaking, scrapbooking, home decor, quilting, applique and fashion projects! An easy to use, multi- purpose creative system. Works with the entire Sizzix product library except the Bigz Pro Dies. Cut or emboss shapes up to 11x8- 1/2 inches. 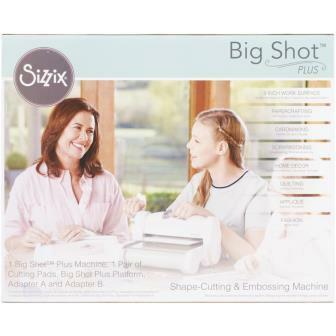 This 14x17-1/2x8-3/4 inch package contains one Sizzix Big Shot Plus Machine with a 9 inch work surface, one pair of cutting pads, a Big Shot Plus Platform, one Adapter A and one Adapter B. The machine size is 15 3/4" x 11 3/4" x 7 1/2"